I'm finding it a little odd, but I'm hankering to work with wool. A little knitting and planning some needle felting for the owlets - mermaids have been ordered!! I also have some ideas simmering for Autumn and Winter with these woven wools I've had for a little while. Popsicle (aka. my father in law) found the check fabric at the bottom of the pile on one of his garage sale trawls - bless! I'm thinking pants. I'm hoping to add more unisex and boyish things to the owlet shop this year because I often have requests. Why is it that boys are so often overlooked? The bright colours are gorgeous...lucky owlettes. My MIL bought my 2 year old a dress made from recycled men's suits recently and it looks fab. I am looking forward to seeing what you some up with. LOVE that first pic. 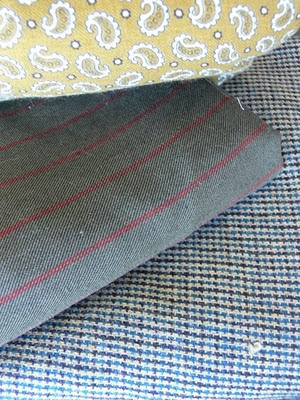 The tweedy fabrics look great and will make some excellent manly outfits I'm sure! Those wool rovings look like fairy floss... delicious. The wool look beautiful. 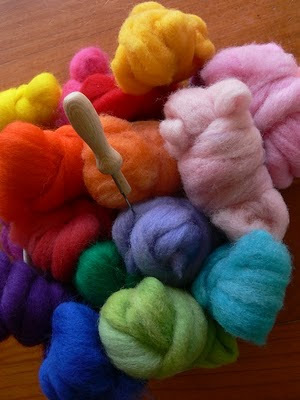 I would love to learn how to needle felt. I love the wool. Makes me happy just looking at all that color.